During my last visit to Latvia I learned Uljana Semjonova lives in Riga. 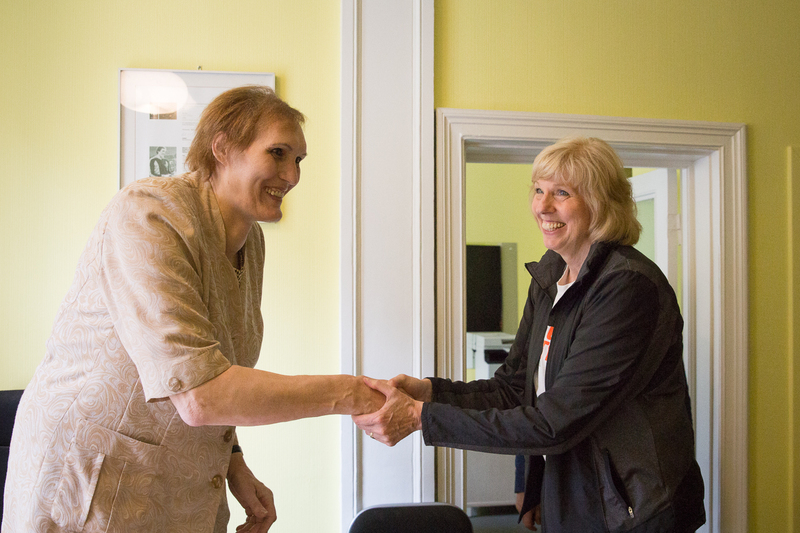 Since then, I’ve wondered if it would be possible to meet the Soviet women’s basketball legend should I return to Latvia. 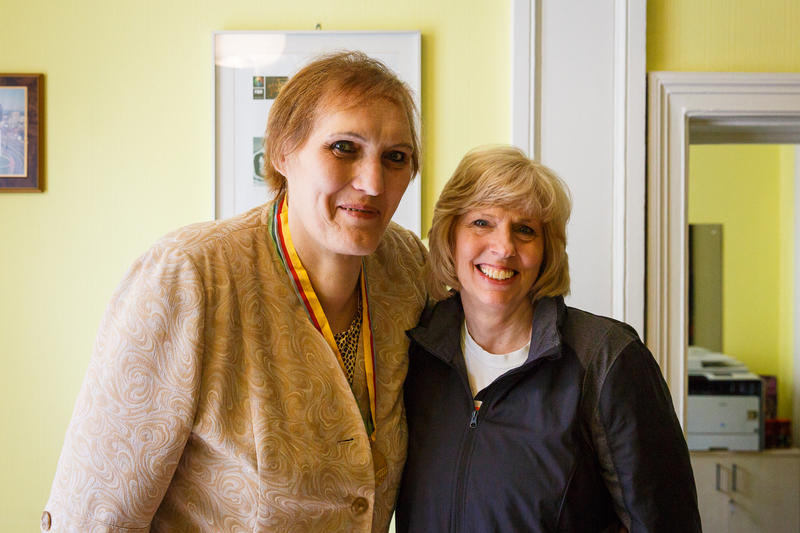 Uljana was a Soviet Super-star playing for the USSR women’s basketball team from 1971 until 1985. She was an unstoppable force at 7 feet tall (sources differ on her height from 6’11 – 7’2”). I never had an opportunity to play against Uljana in international competition, because of the Soviet’s boycott of the 1984 Olympic games, but I did play against her when I was at Oregon State. In 1979 The Soviet National Team was touring the USA, playing exhibition games against university teams. The Soviets at that time were dominating women’s basketball. We lost. The score wasn’t even close. When I learned that it would be possible to meet with Uljana I was excited, and a bit intimidated. I had preconceived ideas of what she would be like. I imagined that she would be polite, but maybe a little annoyed at my request, since I’m sure she has a lot of people who want to meet with her. A plan was made to meet at her office. I was sure she wouldn’t have her medals with her so I decided not to bring my Gold Medal from the 1984 Los Angeles Olympics (I had brought it with me to Latvia) since I felt a little silly showing my one Gold Medal to someone who had gone undefeated in 18 years of international competition (no joke). The moment we walked into her office all my preconceived ideas went out the window. She greeted us warmly and had coffee and snacks prepared for our visit. Still, I anticipated that she might be hesitant to share openly about her experiences playing basketball for the Soviet Union, so I began my questions asking about the foundation where she works. 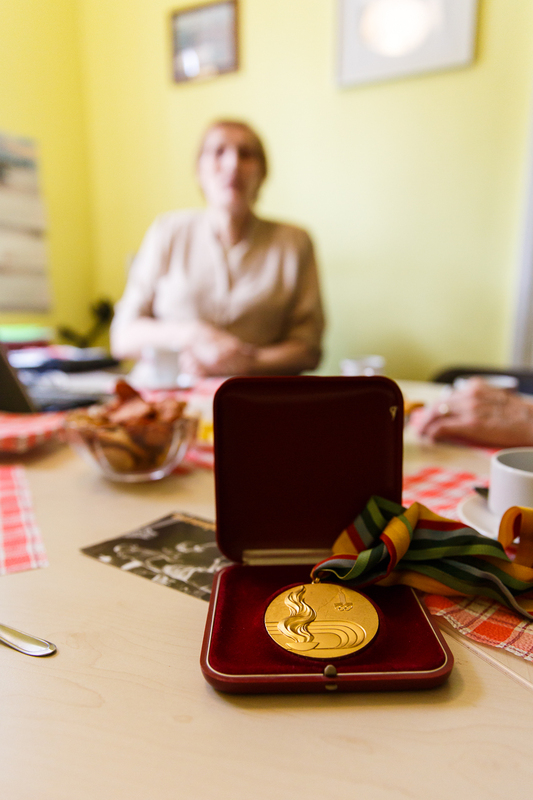 Uljana explained that when the Soviet Union broke up former Soviet athletes were left without State support. Many of them live in poverty today. Her foundation helps to raise money to provide a small pension for about 300 former Soviet athletes. I was curious what it was like to be an athlete in the Soviet Union. She had started to play basketball at the age of 13, and by the age of 16, she was playing professionally. Did she originally choose to play basketball, or was she pressured to play? With a huge smile, she declared strongly and clearly that she played for the love of the game. In fact, she still loves the game. And even with her obvious natural physical limitations because of aging , when she watches young player on the basketball court she wishes she could join in with them. I was also surprised to learn that the national team usually trained for only four months out of the year. She was the type of competitor that not only worked during the normal practice, but would spend extra time working on her individual skills to be a superior player. During the rest of the year Uljana played for her Soviet club team. At one point in our conversation I asked if I could change the subject. She smiled and said “Ask whatever you want.” She explained that it was so wonderful to be able to talk openly about any subject. She went on to describe what it was like to be a public figure in the Soviet Union. As the most well-known athlete on the Soviet Women’s Basketball team Uljana was often asked for interviews. It was often difficult for her to answer questions because there were all kinds of subjects that she was not allowed to talk about publicly. Not only was it hard to talk because it was hard to avoid so many topics, it just isn’t her nature to be a close off individual, instead she is naturally open, sharing, and trusting. Just to be safe, she asked her Russian translator to edit her answers if she happened to say something she was not allowed to say. I got the feeling that request wasn’t necessary since they probably what would have censored her anyway. Uljana talked about her many travels to the United States as well as many other western countries. She said she was often offered opportunities to come and live in another country, but she never wanted to leave her home country of Latvia. Not only are her family and friends here, but everyone in Latvia loves her. She has a lot of difficulty walking these days, but whenever she needs to get somewhere she always has someone wanting to help her. She is humble enough to accept help when she needs it, but insists on trying to get around on her own when she can. During her travels to western countries she was assigned Soviet security to make sure she would always return to the Soviet Union. Sometimes she was aware of their presence and sometimes not. She recounted a story of a shopping trip in the United States. As she exited one of the stores a Soviet security officer was there to give her directions. She wondered how many others were following her and whether they had followed her into the lingerie shop she had visited earlier. We all had a good laugh at that story. Uliana was inducted into the Basketball Hall of Fame in 1993. She tells a story of meeting, fellow inductee, Julius Erving. She was walking a ways behind him when he turned and recognized her. He immediately stopped and introduced himself. Uljana recalled that she was very surprised Julius Erving knew who she was. She said it made her feel so good. In her acceptance speech, she spoke only four words in English. At the very end of her 4 minute speech, (given in Latvian through a translator) she said: “I love this game”. That short phrase was met with a rousing round of applause. She explained to me that later someone from that NBA approached her and asked if they could use that phrase for the NBA. She was flattered and said yes. 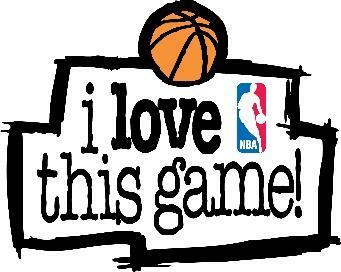 As you may recall that exact phrase became the NBA slogan in the mid 90’s. I was curious to hear from Uljana about her experience with Christianity growing up under Communism. She warmly expressed that she is a Christian. As close as I could understand she follows an Eastern Orthodox brand of Christianity. She explained that her parents were also Christians. Growing up she was not able to go to church in the Soviet Union, but because she traveled so much with basketball she always tried to go to church when she was visited any western country. She explained how it was so good for her heart to be able to go to church and light the candles. I asked Uljana if she felt that her strong passion for people was because of her Christian faith, or if it was just her nature. She felt that is was part of her nature. She explained that her mother had such a soft heart. Even with six children, Uljana’s mother would always open her home and her heart to help others. Uljana explained that her mother was often hurting for the hard situations of others under Soviet rule. This caring nature is found in abundance in Uljana through her work with the foundation as described above, and also in her passion for providing opportunity and eagerness for today’s Latvian youth to enjoy basketball. For example, her name headlines on an international girls basketball tournament that is named after her that is held in Riga, Latvia. Our conversation went on for over an hour. My poor interpreter, Gatis, had a very hard time keeping up with us. I would ask a question and Uljana would enthusiastically respond, but before Gatis could translate everything, she would add more and more to her response. I wanted so badly to understand Latvian, because I knew it was impossible for Gatis to translate everything. Fortunately, much of communication is accomplished through body language. There was no misunderstand that Uljana Semjonova was a person filled with passion and joy. Her openness and kind heart cannot be diminished by Communist oppression or the difficulties that aging brings. She is truly a Champion. Thank you first for putting yourself out there and secondly for telling the story. We just aren’t so very different, are we? How could we be, since we are all His children?